The negotiations of Vladimir Putin and Aleksandar Vucic were held in Belgrade within Russian President’s formal visit to Serbia on January 12, RIA Novosti informs. According to Vladimir Putin, the relations between Moscow and Belgrade in the cultural and humanitarian field are strong and keep developing and more intense over time. He recalled that Russian cultural groups perform in Serbia on a regular basis. The Festival of Russian Spiritual Culture starts in Belgrade next month. Russian leader also noted the draft of the Church of Saint Sava interior design. This is the biggest Balkan church and one of the most significant Orthodox churches in the world, which is being built with help of Russia. Putin and Vucic visited the Church and symbolically finished the mosaic Jesus Christ figure with the flower fragments of national colors in Saviour’s halo. 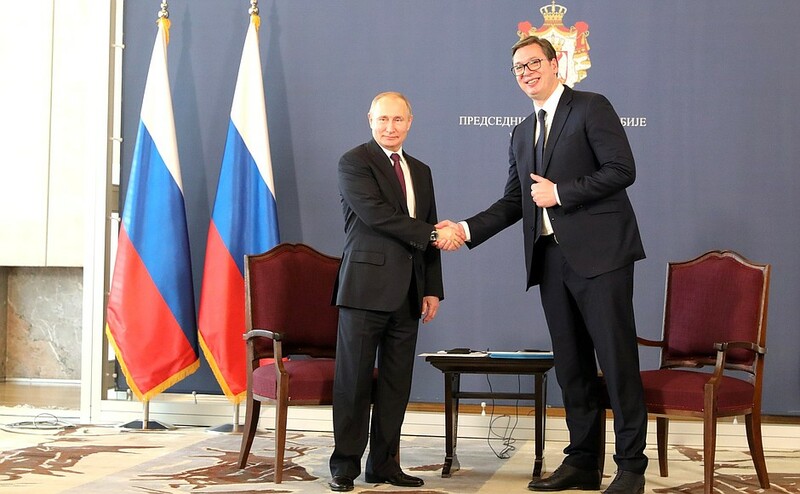 Putin also presented the Russian Order of Alexander Nevsky to Vucic for his contribution to the development of multilateral cooperation between Russia and Serbia. Moscow and Belgrade reached an agreement that Russia will transmit Serbia the 166th page of Miroslav Gospel, the oldest Cyrillic monument to Serbian literacy, and Serbia will return several Nicholas Roerich’s paintings to Russia. The parties discussed the development of bilateral relations, Kosovo situation, and the involvement of Serbia in European branch of TurkStream. Alexandar Vucic expressed his interest in the latter one. Vladimir Putin emphasized that Russia is ready to invest about 1.5 billion dollars in the branch building towards Serbia.